Sometimes people mistake confusion for democracy – for the whole district executive members of one political party to line themselves up for the purpose of contesting for a single parliamentary seat is indeed a sign of confusion, not of democracy. The Movement for Democratic Change led by Morgan Tsvangirai (MDC-T), however, seems to be unaware of this fact as six of its Bikita district executive members are readying themselves to battle it out at party primaries ahead of the 2018 general elections where the winner would face candidates from other political parties. Timothy Ndongwe, the MDC-T Bikita district secretary, who lost to Heya Shoko in 2013 primaries, is ready to try his luck again. Ndongwe will battle it out with fellow district executive members Zororo Moyo (deputy secretary for information), Eliot Muposhi (secretary for disabled), Cassiano Chaodza (secretary for defence), Innocent Chemvumi (secretary for elections) and Malvin Mangwayana (deputy treasurer) as well as Pikirai Gutuza who holds no position at district level. 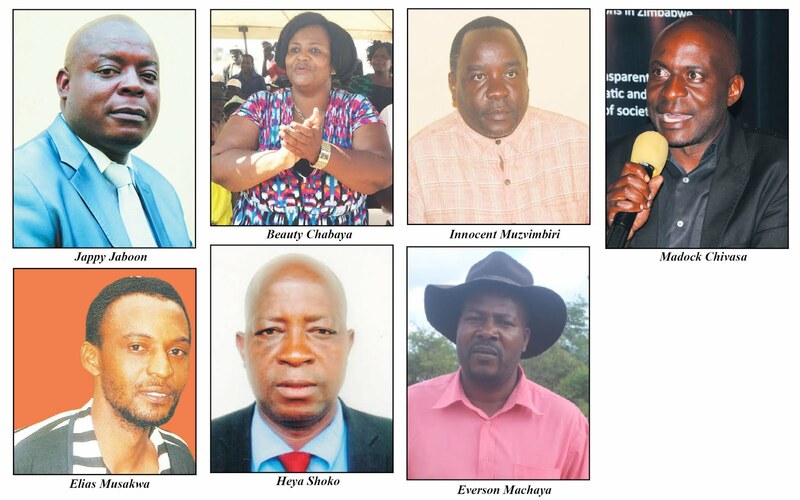 More interestingly, the majority of the candidates are from Bikita West's Ward 9; that is, Chaodza, Moyo, Chemvumi and Mangwayana while, Ndongwe and Gutuza are from Wards 13 and 19 respectively. I must say Ward 9 has politicians who are too ambitious! It is a democratic right for MDC-T executive members to battle it out to represent the party in the 2018 general elections but it also exposes the serious levels of disorganisation within the district. They could have engaged each other and come up with a single candidate from the executive who will then contest against other party members like Gutuza who are not in the executive. While the candidates might hide behind the democracy banner, it is clear that the executive is not united and it exposes them as people with a serious hunger for power. All the candidates have limited resources that, when combined, cannot match any of the candidates from Zanu PF. If MDC-T is serious about reclaiming the Bikita West seat from the ruling party, then the district executive should find each other and come up with one candidate who would go to primaries with non-executive members. The winner will then face candidates from other political parties like Madock Chivasa of the National Constitution Assembly (NCA). Chivasa got over 300 at the Bikita West by-elections held on January 21, 2017 and he would continue from where he left. Heya Shoko is also eyeing a comeback with the National People's Party (NPP) ticket after an embarrassing defeat at the by-elections in January this year where he contested as an independent candidate. Hopefully the former MDC-T Bikita West legislator will play his political cards right come 2018, though not contesting for any post is currently the best advice. Another independent candidate at the January by-election, Innocent Muzvimbiri is also said to be negotiating his way so that he would contest under the MDC-T ticket. Muzvimbiri would be far much better than the other candidates that have emerged in the MDC-T so far though he might not be the best candidate to face Zanu PF. Beauty Chabaya, after winning the by-elections and tested power for close to two years, will be hoping for another term in parliament come 2018. It will be a stroll in the park for Chabaya as only five other candidates have already emerged from her party. Elias Musakwa, who lost to Beauty Chabaya in the primaries for the parliamentary by-election which Chabaya went on to win earlier this year, is understood to be very much in the race too. Musakwa, who has become a perennial loser, might stand a better chance this time around. Bikita South legislator Jeppy Jaboon is said to be eyeing a move to Bikita West in 2018. Jaboon's chances are, however, now slim after he was last week slapped with a five-year suspension from party activities for allegedly working to divide Zanu PF in Masvingo province. The suspension means Jaboon may not be able to contest party primaries, even in Bikita South where he had chances of seeking re-election. Everson Machaya, a Masvingo-based businessman is also said to be interested in Bikita West and so is Retired Major-General Gibson Mashingaidze who controversially lost to Chabaya ahead of the by-election. Wellington Mutisi, a property developer, is also said to have interests in contesting for the Bikita West seat under the Zanu PF ticket. More names are however, expected to emerge especially from Zanu PF ahead of the primary elections expected later this year or early next year. All the candidates vying for Bikita West are not so educated and that might spell doom for the constituency which may end up with somebody who will fail to articulate issues and fully represent the people in parliament. Mposhi is a former Zimbabwe Congress of Trade Union (ZCTU) southern region coordinator and he has at least a ZJC certificate. Having worked for the labour union for quite long, Mposhi probably felt he is now ripe for a political position but does he really have what it takes to represent the electorate in the national assembly? A local governance seat would be a more ideal post for Mposhi though. Moyo is a former police officer and he at least has an O' Level certificate including Maths and English subjects. Having retired from the police, Moyo is now resident at his rural home in Ward 9. Moyo has does not have enough resources to go around the whole Bikita West constituency soliciting for votes in the event that he wins the party primaries. Hopefully MDC-T would provide assistance to its candidates lest Zanu PF has a walkover in Bikita West. Moyo however, has a traceable history in the MDC-T party where he rose through the ranks to become district secretary for information. Chaodza is said to be a security guard in Mutare and that speaks volumes about his level of education. His job also foretells the kind of resources Chaodza might have, and whether they are enough to contest for the seat or not, the electorate will decide. He however, has more experience in opposition politics considering that he joined MDC-T during its inception. Ndongwe is a secondary school teacher with at least a degree in education. It has been an open secret that civil servants are not well paid in Zimbabwe and for one to save enough resources for a vibrant political campaign, they would need to have other sources of revenue. In this case, Ndongwe has no any other viable business and that means he would have a mammoth task against resourceful Zanu PF candidates if he wins the primaries. Ndongwe has been in this game for over a decade now, having lost the 2013 primaries to Shoko but he is still willing to try his luck in 2018 again. Mangwayana is a primary school teacher with at least a diploma in education. Just like many teachers in the country, Mangwayana does not have enough resources and that might hinder his ambition to contest for the Bikita West seat. Chemvumi is a rural businessman with a grinding mill and a kombi. It was not clear by the time of going to print if Chemvumi even has a ZJC certificate and the same goes for Gutuza who is said to be in South Africa. Zanu PF's Chabaya at has an 'O' level certificate and is said to have some successful businesses in Harare. Chabaya was virtually unknown in Bikita but she rode on her parents' popularity both in Bikita West and Zanu PF. Zanu PF national political commissar Saviour Kasukuwere and Jeppy Jaboon also played a critical role for Chabaya to win the party primaries and subsequently the by-elections. Team Lacoste faction was extremely bitter with Chabaya and many still have that bitterness. Chances are slim that Chabaya will win the party primaries and her woes are worsened by the fact that both Jaboon and Kasukuwere who saved her the first time are under fire in the party. Rtd Major –General Mashingaidze has many professional courses he attained during his time with the national army. The former army boss is well resourced but lacks that killer punch in politics. He really needs to understand the different dynamics between his former job and politics if he is to win the party primaries. Politics needs one to be humble and not commanding! Musakwa is a great musician. The Ngaavongwe hit maker seems to have more understanding of music than politics. He went to the school of music and it would be best if he concentrate more on music than politics. However, he might be rewarded for his patience having been lost the elections in 2008 and 2013. Machaya is into civil engineering in Masvingo. He has been in Zanu PF for more than 20 years now but his chances of winning party primaries are still slim especially considering his kind of approach to politics. He was duped and later dumped by Jaboon during the run-up to party primaries ahead of the by-elections. Machaya needs to understand power dynamics in Zanu PF and who to associate with if he really wants to win the primaries otherwise it will be a waste of resources. By and large, Zanu PF stands a better chance of winning Bikita West constituency especially considering the calibre of candidates that have emerged across all political parties so far. The MDC-T has to work really hard and whip its structures into line otherwise they will suffer an embarrassing defeat in Bikita West. The whole district executive members from Bikita West cannot be seen contesting; fewer candidates, instead, have to compete if the party is to remain united. The party should also come up with candidates who have resources so that if Zanu PF donates rice they will also come and donate sugar not just watching and criticising. It would be best if the above mentioned MDC-T candidates consider contesting for local government seats than being too ambitious for nothing.